Following on from the high performance engine build detailed in earlier blogs, and a very careful engine running in process, Phil brought his cherished S14 200SX back to us for a check over and to tune the HKS FCON VPro ECU to maximise the performance and to see whether our number crunching had been close to the designed the specifications. Considering that we had specified the engine package to hit a target of 400hp at the hubs, the result of 412hp (DIN corrected) and a very flat 336 ft/lbs at the hubs should put a smile on Phil’s face! 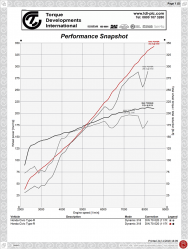 Here’s the raw dyno data. You can see that as it was quite a cold day (8 degrees C) the DIN correction is making quite a substantial downwards adjustment from the 432hp observed at the hubs! At Torque Developments International, we understand the importance of engine performance and reliability to your success. We therefore take the business of engine preparation very seriously, and the results achieved reflect this. In order to provide highly competitive engines, there is no substitute for the highly skilled craftsman using modern and accurate equipment, supported by an experienced team of development engineers and component procurement staff. 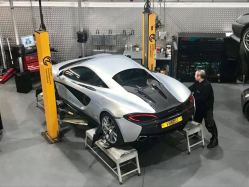 Torque Development’s modern facility provides a near clean room production environment where each and every process in carried out to strict ISO9001 quality principles and within a comprehensive “no fault forward” culture. In all engine preparation process, careful design and meticulous attention to detail comes as standard. In most cases, a single qualified Engine Technician will be responsible for the entire Torque Developments engine build from initial strip down to testing and commissioning. Please contact Torque Developments to discuss your specific engine build requirements.